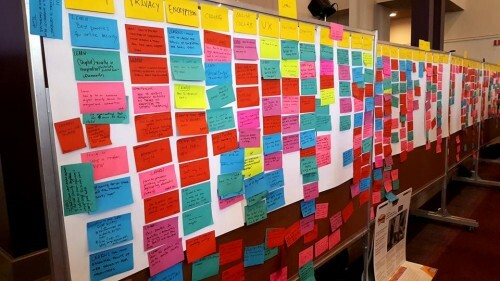 Brainstorming is a common concept but have you “Agenda Hacked“? This is a methodology of collecting and collaborating on topics that you want to discuss. This week I am at the Aspiration Non-Profit Software Development. The photo above shows how agendas can be community-driven. Once participants provide their input on what they would like to learn, share, and discuss, the team determines sessions to build out agenda based on the audience. Consider it real-time data collection for decision-making. How can we apply this facilitation method to connect with communities and each other? The Netherlands Red Cross initiative team (the 510) has published an article detailing their work using machine learning and predictive modeling. The Canadian Red Cross has partnered with Aviva to do some work Missing Maps. How can Apache’s lessons help Humanitarians? One of my big mandates at IFRC is to help guide various open data and open source initiatives. In the humanitarian space, this is a delicate navigation due to privacy and security concerns. The lessons of building community and sustainable collaboration are well-worn by leaders at large open source groups like Apache Foundation. Something to ponder as we navigate changes. What about big data for Food? This TED talk really nailed the crux of how research and humanitarians can collaborate. As well, Mallory Soldner (speaker) gave a reality check on when data scientists can actually be effective.